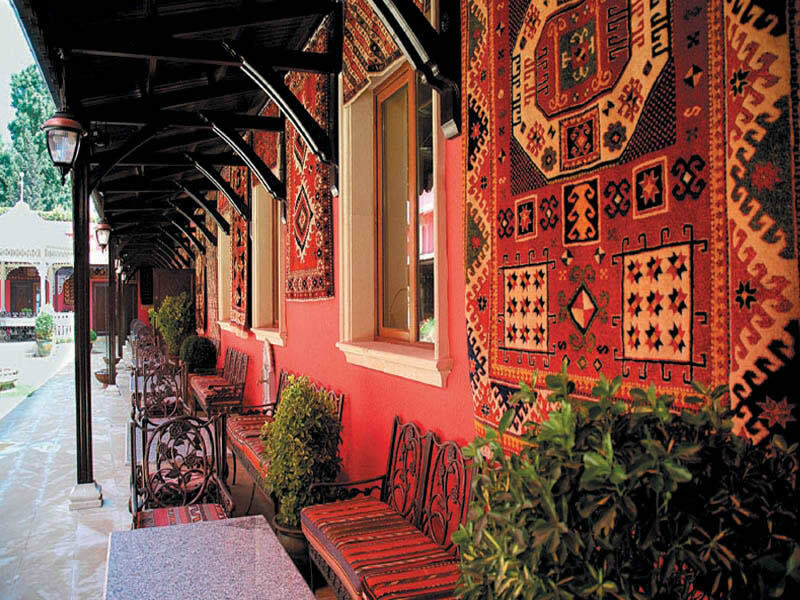 Azerbaijanis have preserved and passed the national tradition of carpet weaving from generation to generation. Colorful carpets with majestic ornaments are a glamorous decoration of every Azerbaijani house. Every family of the Land of Fire is proud of the ancient piece of art kept in their houses as sacred gift of grannies. Magnificent carpets are the national attributes which follow lives of Azerbaijanis from cradle to grave. Every child in Azerbaijani families receives his life carpet from his parents at birth. The recipients of this gift preserve it till the end of his life. It will be a cover under their foot when alive, but also a cover to bring them to grave. Such a love and respect of carpets, which may be regarded as an ordinary household item in other nations, is regarded as the best drive for this famous industry to flourish in Azerbaijan. The art of carpet weaving is one of the ancient industries in the country. For centuries, the "Land of Fire" has been famous for its unique carpet schools. Over the course of history, Azerbaijani carpet has represented its ancient past and unique culture and national identity of Azerbaijanis across the world. Today, however, the carpet is not an integral part of our lives. Despite this, preserving this ancient art is necessary. The 20-year-old Azer-Ilme company is one of such custom-savers. For 20 years, the company could vigilantly guard Azerbaijani carpet art and gain glory and success. The company saved the carpet weaving from a recession in different periods, and revived it after the restoration of independence in Azerbaijan. Azer-Ilme has opened a bright chapter in the history of this art by giving a fresh life to this tradition. Research works of the company has allowed it to eliminate the void in the carpet weaving art. It has also published a number of books on Azerbaijani carpets in various languages. These books are sent to different libraries around the world. Moreover, the company leads searches conducted by expeditionary groups in different regions of Azerbaijan on schools of carpet weaving. Carpet weaving is an art that develops in the process of research. During a research conducted under the project "Azerbaijani carpets. All groups" the specialists gained valuable information about the traditions of carpet weaving, its forms, methods, special features of color and coloring, master of carpet weaving and their followers. Azer-Ilme is also producing some artistic and aesthetic style TV films entitled "Azerbaijani carpets and all their schools". The company aims to restore the forgotten patterns, preserve artistic traditions of national carpets and bequeath them to future generations as well as organizing sales of Azerbaijani carpets in the international markets. Azer-Ilme is devoted to national, spiritual and moral principles, and approaches its goals step by step and loop by loop. It has created workshops in ancient historical centers of carpet weaving as Absheron, Karabakh, Gazakh, Guba, Ganja, Lerik, Shirvan, and Sheki. It is looking for ways to keep the national tradition formed in past centuries at a high level. The company continues its fruitful creative searches by attracting 700 professional artists on carpet, carpet weaving craftsmen, restorers and color masters, qualified teachers, weavers in various regions of the country. The wool and silk bright carpets of high density with the original patterns of Baku, Gazakh-Borchali, Yerevan, Nakhchivan, Karabakh, Ganja, Guba, Tabriz, Shirvan groups have brought Azer-Ilme numerous awards such as Caspian Energy International Award, an exclusive award named after Queen Victoria, the European Quality Award and Ugur national award. Azer-Ilme has successfully demonstrated splendid Azerbaijani carpets in American Atlanta, German Hannover, and Russian Moscow. It represents Azerbaijani culture in museums and private collections in many countries, including the U.S., Germany, Turkey, Russia, Australia, Japan, Switzerland, Italy, Norway, and South African Republic.